I went to do research on it. tried myself, searched on net, made changes and eventually I could find the answer of this question. I even tried 2-3 variations to find what is correct and is working. I went back and posted my answer. Within seconds of my posting the answer, some has downvoted it (I guess DavidPostill himself, unless 2-3 moderators are stalking me), and has deleted the answer saying that it is a comment and not an answer. This is my file showing its name, content, and confirmation message that it has been merged in registry. 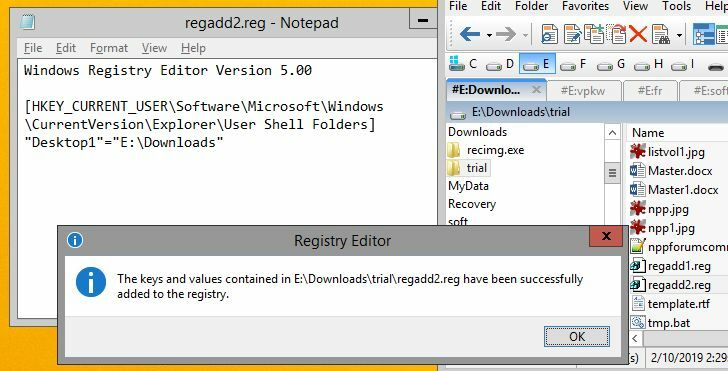 And this is the .reg file that gave message of successful addition. What more can I do to show that I had really done it. And now, undeleting the question requires 3-4 votes that I don't have and these people are not going to vote in my favor, and my valid answer disappeared from the world. 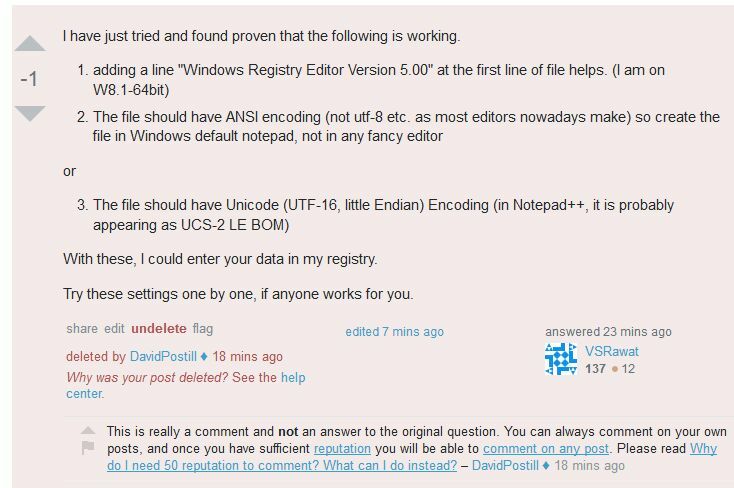 So I want to to say that DavidPostill is stalking me at Superuser.com, downvoting me deleting my tried answer in seconds and thereby now he is harming the site's resources by deleting valid proven answer to reach the person asking question and others in future. This week itself, 6 downvotes on my questions or answers were reversed by system on account of system finding them serial downvoting. Feeling discouraged by such serial downvoting and other behavior I had myself deleted several of my questions and answers thus lost some other upvotes and helpful flags also. I must have got 20-30 downvotes on my posts in all sites here. They chase me in other sites of the group and downvote my posts there also. They have also snatched away my privilege to post question there, so I have to come post here. They have also removed several replies on a discussion that I had started and moved that to chat, to hide it from people. This way they are distorting history to make believe that such thought was never expressed and such things were never discussed. Please give it a thought and see whether such unruly behavior of this site's moderator harassing and bullying and discouraging new members is what you had in mind when you created this site to help people. I went to do research on it. tried myself, searched on net, made changes and eventually I could find the answer to this question. I even tried 2-3 variations to find what is correct and is working. What you submitted was considered commentary. Commentary submitted as an answer will be flagged by the community and promptly deleted by the community through several votes or a binding moderator vote. Within seconds of my posting the answer, some has downvoted it (I guess DavidPostill himself unless 2-3 moderators are stalking me), and has deleted the answer saying that it is a comment and not an answer. Your answers are appearing in a community review queue that is currently empty. The queue being handled within minutes is not that odd. 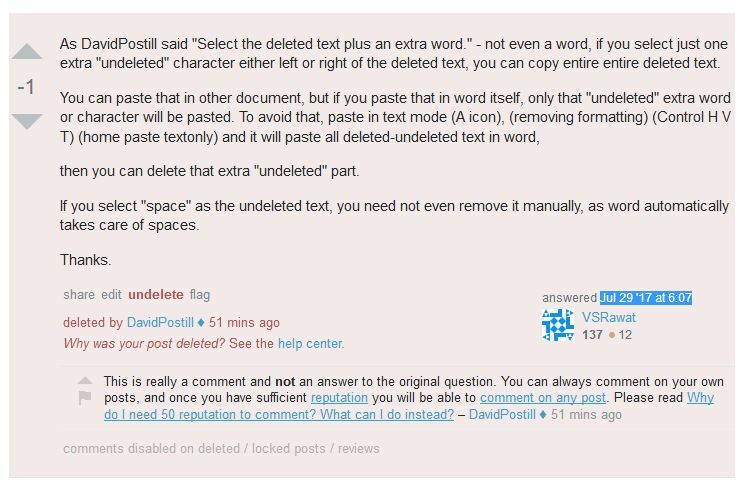 Your answer is not going to be undeleted by the community because it is commentary. Removing contributions due to a couple downvotes which were reversed only will result in an answer ban. Several of your answers are extremely low quality. Hopefully, you only deleted answers which received downvotes or were consider commentary, instead of the contributions which received upvotes. You shouldn't delete any contributions to be honest. They have also snatched away my privilege to post a question there, so I have to come to post here. This is due to the low-quality questions you have asked in the past. You were warned of the quality of your previous questions before this happened. You will be allowed to ask another question at Super User in 6 months or when your contributions improve and receive enough upvotes. ALL contributions count towards the automatic system that determines if you can or cannot submit new questions and/or answers. hey have also removed several replies on a discussion that I had started and moved that to chat, to hide it from people. This way they are distorting history to make believe that such thought was never expressed and such things were never discussed. Your past commentary was either flagged by a community member and then deleted by a moderator or was converted into a chat. As for your other answer that was also deleted, it was considered, the commentary also. The removal of commentary that is being flagged for moderator review is not considered moderator harassment. It also is not considering bullying from the community. Your contributions have issues, I know I have provided feedback on a few of them and saw no attempt to address those issues with the contributions I provided feedback on. OK, I’m not familiar with your history of contributions, so I can’t comment on that. VSRawat’s answer was posted 22 minutes later. But VSRawat’s answer has some information that isn’t in the first answer. True, VSRawat’s answer doesn’t address the issue of specifying data in hex, which Gert Jan Kraaijeveld’s answer addresses — but so what? The question wasn’t about that. Not the answer you're looking for? Browse other questions tagged support disputed-flags . What links count for the 2 link limit for new users?